Interested in the perfect LED grow lights for your grow room? From large to small grow lights, chances have we reviewed it, so we are here to help with any grow light decisions you need to make when purchasing a quality set up. Don’t waste your money, let us help you decide what is right for you by examining the best in greenhouse lighting for your growing. Picking out the perfect lighting for your grow room or tent can be difficult. Depending on your set-up you may want to consider a few things. The power of your lighting should reach all areas of your grow room. From seeds to flowering, light must flow to every square inch. Is your grow area one specific spot or do you switch depending on the life cycle of the plant itself? Is your light spectrum an all-purpose light or do you use a mixture of lighting depending on the stage of the plant? No matter the situation, LED lighting is a sure fire way to go, as these bulbs are cost-effective and allow for a full spectrum approach to growing your cannabis. They also eliminate worries about the heat output, as well as bulb replacement, which is 1000 times more efficient than traditional light bulbs of yesterday. It might seem overwhelming at first to beginner gardener when it comes to growing indoors, but hopefully, this guide and review website will help you along the way. The first step is matching the lighting sizes with space you plan to grow in. Here is a deeper look at some of the best L.E.D. grow lights that are available along with growing area dimensions to determine if the lighting is right for you. 4.5ft x 3.8ft coverage at 18″ height – PERFECT for compact space. Good for 2’ X 2’ growing areas. Great for small areas. 4.5ft x 4ft coverage at 18″ height. Good for small areas or add multiples to increase coverage. Square footage of the coverage area – Light should manage to spread across the entire grow area and work its way into the nooks of the bush. Our guide makes it easy to figure out your area by telling you the area for each light we recommend. This way you will know if you have enough light coverage to grow in the space you have dedicated for your farm. Lights can easily be “stackable” or be able to line up to increase your lighting area. Depending on the area of your grow room or grow tent you will want to purchase a light with enough watts to give your plants what they need. For larger grow spaces, consider at least a 1000 watt led grow light for maximum coverage. If you are considering a growing a small amount of plants then a simple 300 watt grow light would suffice. Check out our LED grow light reviews for specifics growing areas. The trajectory of your lighting and angle at which your LED grow lights are set – A bigger angle means more light dispersion that can flood a room but less direct light and vise versa. Remember the amount of light a plant gets in strength can impact its growing cycle. Price – The amount you have to spend can directly influence your ability to get a decent product that makes growing cannabis easier. The products we have selected for best of LED grow lights have also been weighed as cost-effective. Plant Growth Cycle – Full Spectrum LED lighting is important if you anticipate growing with the full growth cycle method. The complete spectrum will help grow robust bud. Safety – You want to grow in a safe environment and need to understand how you can achieve this with the lighting you choose. Lighting uses electricity and must be hung in a safe manner, especially with constant watering. This step should be planned out accordingly and with conviction. As a newer source of technology, LED grow lights seem to have the upper hand when it comes to indoor marijuana grow operation. For the most part the LED burns less hot, costs less in the long run as they yield far less electricity, are safer to use, they do not have a stuttering lighting effect and don’t take a few minutes to warm up, and lastly they can run for around 50K hours before ever having to be changed out with a new bulb. That is a lot of plants! LED grow lights use just way less than fluorescent and even more in HPS bulbs. In fact, about half the power as HPS lights use and create much more return per watt usage as studies show. Many studies and smokers report an increase in quality and oil/terpene production, and more healthy buds and blossoms. LED lights run cool, so no extra temperature control such as blasting the air conditioning in hopes of helping your plants along is necessary, apart from venting fans. If you are still stuck on old school fluorescent lamps for your grow lights, you may want to rethink your farming and upgrade to LED growing lights for better results. Just think, only fifty to sixty thousand LED hours before you ever have to change a bulb. Our newest and most favorite review. The Mars Epistar Pro II 80 really impressed us with its grow yield of around 2 grams per watt which is awesome! A true led grow light that can easily replace a 400-watt HPS bulb. This LED grow light is even on par with many of the 1000 watt led grow lights on the market. A cost-effective and high-quality bulb all around! The VIPRPASPECTRA Reflector series LED grow light is the perfect choice for small areas or grow tents that have limited space. This best selling grow light is simply easy to manage. It consumes only 200 Watts vs a typical HPS bulb of 400 watts. It is a full spectrum LED grow light that provides nourishment across all growing stages. Perfect for a grow area around 2.5″ X 2.5″ at a 24 inch height. The LED gives this lower cost, yet efficient light high praise. Perfect for a small apartment or if installed adjacent to multiple lights can easily expand your farming ability and the number of plants you can cultivate. This Growstar LED growing light is perfect for cannabis production. They came up with a 90 degree optical lens to reduce light loss and increase ultra high lumens for output and plant growth production. It is a full spectrum LED and consumes only 250 watts of power. This lamp also runs very cool and comes with an optimal cooling system for those long growing seasons. Never fear as this LED grow light comes with a 100% money back guarantee so if you are not fully satisfied you can return it easily. This LED grow system covers a 3 foot by 3 foot area so the space is limited, but remember you can always double up to grow with your little farm. One of the most respected brands as far as reliability goes. This LED grow lamp is easy to use and saves a ton on energy costs. Comes with a great warranty at 2 years and backed by a professional servicing center in case you have questions about how the grow light operates. Coverage is pretty good as well. Can give the right full spectrum light spread to an area 2.5′ by 4.5′ wide area. This is more of a rectangular dimension so keep that in mind if you have a square grow tent. This grow light is typically on sale from Amazon Prime and gets great reviews. Advanced Platinum Series LED Grow Light is a Perfect Example of What A Grow Light Should Be. The Advanced Specrta Series P300 is a top seller compared to its closest competitors. Offering a large scale growing area at 4.5 feet by 3.8 feet along with whisper quiet fan technology. Optional Veg/Flower controls with upgraded aluminum heat sink for heat dispersal. A boastful 12 band spectral output of light madness creates a smooth efficiency with this bad boy on the grow light block. 5-year warranty in case something goes wrong as well to make you feel better about the heftier price tag. You may want to save up for this one as it does a great job with cultivating the right light environment. 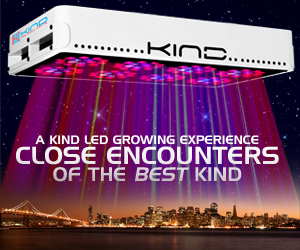 The strongest LED grow lights available on the market today! Featuring the maximum PAR per watt possible LED grow light which guarantees maximum yield with minimal power usage and heat. PAR and mid output equivalent quality that seems to be unrivaled for the most part! There is a difference between every LED grow light and it is extremely important to choose wisely. Greater yields, lower growing temperatures, better efficiency is what this LED is all about. What’s more, these lights all feature toggles for Bloom vs Veg light spectrums to provide maximum performance from seedling through harvest and flower. The Veg spectrum features a heavy output which leaf development favors. Engage the Bloom switch whilst shifting the output to some bloom pink/red heavy 29, to enable panel power that is 100%. No requirement for any additional lighting since there is coverage from seedling to harvest. The key to this Platinum LED achievement is combining an optimal blend of 12 bands of spectrum that is complete IR; providing your plants precisely the tuned spectrum that they require. The P300 effectively consumes only 180 watts of power, while giving your plants 100% usable full spectrum light. The P300 is a light that comes highly recommended, thanks to the mix of power and affordability of it. It is appropriate in most situations from small grows like grow tents, into a full-scale operation. Cannabis gardens will excel beneath the P300. That is Platinum LED. Compact but mighty. This lovely little LED growing light is affordable yet perfect for a small grow of a personal plant or two. Assembly is very easy and the energy savings of this lamp are outstanding, only consuming 132 watts. Perfect for a 2 by 2 area of growing. Think small discreet grow tent for this LED. Also runs very cool due to its compact size. Plug in for on, and unplug for off. Mars Hydro keeps it stupid simple with this box. Also safe and environmentally sound, this marijauna grow light boasts the ETL certification. Comes with a 30 day money back guarantee. This dual spectrum LED light kit is great if you are looking to grow a single plant. Very affordable at around 40 bucks for 45 Watts, they also carry larger wattage LED’s. They are ideal for vegatative phases of plant life and for cultivating smaller plants in smaller areas. Temperature, as always with LED Grow Lights stays very cool, compared to yesterdays old school bulbs. The only fans you will have are the ones that smoke the final product from these great buys. Again the price alone is what sold me. It is wonderful to live in a day and age in which cannabis cultivation in a handful of States is not only legal but very affordable. This company has been imitated before, just due to their great reputation and growing standards alone. GrowStar has come along way in the best LED Grow Light category and its series of new models prove just that. Always impressed by their 90-degree optical lenses that reduce light loss, thus ensuring maximum brightness is achieved via ultra high lumens. A full spectrum grow light, perfect for cannabis, is backed by a 100% money back promise as well as a 3-year warranty in case your bunny rabbit decides to pee on your new light. Perfect for a 4 foot by 3 foot grow tent or space at around 24 inches off the base. Max coverage is 5×4 but would recommend keeping it a bit smaller than that for best plant growth. Claiming to be “scientifically engineered” to maintain a balance of the PAR/Lumens ration of output and overall coverage area. Seem to work, whatever it is. Very balanced optimal full spectrum wavelengths. Very similar to the Viparspectra 600w review we did, but the PAR600 has a few more advanced options such as a 3-way switch for even more controlled lighting for your indoor growing needs. 3 year warranty on this LED grow light and perfect for a 3 x 3 grow room. Low volume noise fans so they won’t irritate you as you trim your little happy plants. The P450 reduces electrical consumption while it cultivates. Consuming 250 watts of power. That is real savings, providing your plants the full array of light spectrum they need. The P450 is ideal for small room expands, small/medium tents sporting hydroponic trays or large tent operations. Anywhere you would utilize a HPS, utilize the P450 instead, which reduces a large percentage of the energy and heat usage that of lights of lower technology. The key to this PlatinumLED achievement is currently mixing an optimum blend of 12 bands of spectrum that is total to the IR – giving the plants the spectrum that is required depending on the stage of the plant. Intensified by 90 degree optical lenses that penetrate deep inside the canopy, the higher-output running, more effective 3W LEDs dismisses the competition. The Galaxyhydro LED Grow Light at 300 watts does a big job for a small LED grow light. This full spectrum LED unit is perfect for s small cannabis plant, covering about a 2 X 2 area at 25 inches above the plant. Perfect for a closet grow or small growing tent these lights can pack a mini sized punch. Success with this light is easy as operating this LED is a snap. Cooling is also no concern with this lamps patented cooling system. GalaxyHydro has a great reputation in the industry as a professional light manaufactuere and has put a ton of research into their lighting products. They also aim to keep their customers happy. LED grow lights works using multiple little light diodes that produce a “sun like” spectrum. Cannabis absorbs a tremendous amount of blue spectrum light, more so than any other colors. By introducing a more UV friendly light profile, one can push infrared spectrum harder thus cycling into plant germinating and budding or flowering in the marijuana itself. A full controlled environment becomes complete with grow lights that feature LED bulbs. Think about it. No rain and no clouds that can hinder growth periods in a plant. Being able to create a stable environment that plants love, creates happy plants. You can change lighting wavelengths on the fly depending on the phase of the plantings life cycle. Small Grows Became So Much Easier With The Onset Of Light Emitting Diode Grow Lights for many reasons. First the heat factor. These lights can be installed in rows and stay cool. Heat was always a problem for tent grow or small rooms where build up could fry the plants and also pose a fire danger if to close to combustible materials. Ease to use. That’s right. Not much special knowledge when it comes to installation of LED lighting. It comes down to a matter of being able to raise and lower them which due to their low heat output it can be a snap. Lighting control is a plus as we spoke about this before. Being able to cycle between Infrared spectrum and UV makes a complex grow, easy. Energy costs go way down with these low electricity diodes do there job better then their older counterparts. All Hail LED Grow Lights! The combo of these benefits is the perfect storm to make LED grow lights the obvious choice when it pertains to a small indoor grow operation. The biggest choice in picking out a lighting system for your grow tent would be what type of wattage should I use? Essentially you should have a wattage of 25 per every square foot. That is, if you have only one plant per square foot. If this doubles to 2 based on your space, although not ideal, you will want a wattage of 50 watts per every square foot with LED’s. Every grow space is different and that always ads an element of science and art to every farm involving cannabis, but the bottom line is, growing weed is a labor of love and should be considered as such. Doing something right, like weed farming is worth doing right.